Michy Batshuayi set for Ligue 1 return? 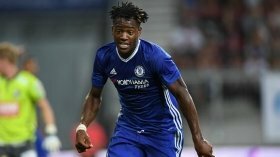 Chelsea striker Michy Batshuayi could be offered a return to the French Ligue 1 at the turn of the year with AS Monaco keen on securing his signature. The Belgium international was deemed surplus to requirements under Maurizio Sarri prior to the start of the campaign and this saw him make the switch to Valencia on a season-long loan. However, his time at the Mestalla has been far from successful with just three goals across all competitions and reports have already tipped Batshuayi to seal a return to Stamford Bridge. According to Get French Football, the former Marseille man could thereafter make the temporary move to Monaco with manager Thierry Henry keen on a reunion with the striker. Henry has previously worked with Batshuayi while being the assistant coach of the Belgium national side and the marksman appears to have been identified as a potential solution to the club's struggles upfront. Monaco are currently right in the relegation mix after picking up just three wins this term. They are three points adrift of safety after 17 games into the season.